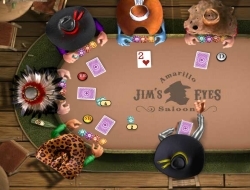 This is a second version of the very popular Governor of Poker game, but the goals remain the same. Earn yourself lots of dollars and control by constantly winning at the poker tables around the villages of this vast western world. Meet with other players from all over the world and show them that you can play a hand of poker. With the money you earn come lots of choices on what to do with them, because there are lots you can buy, or you can play with them at the no limit tables, where the big money is won or lost. If you want, you can play it safe and acquire a few houses so you can later sell them if you are in need of money. Governor of Poker 2 0.00 between 0 and 10 based on 0 votes.